The 1.2V AA 2300 mAh Maxell Rechargeable NiMH batteries we got for testing here are rated as 2300 mAh minimum capacity and that is the number printed on their package and this kind of surprised us as usually NiMH battery manufacturers print with big numbers on the front the typical capacity and somewhere else with small letters the minimum capacity that their cells should provide. The 2300 NiMHs we’ve got for testing apparently are now being replaced with a newer model that offers 2500 mAh capacity, though as it was not yet available in the shop we got these from we got only the 2300 mAh version. We have started the test of the 1.2V AA 2300 mAh Maxell Rechargeable NiMH batteries with a low constant current discharge rate of 0.2A (the lowest load for AA NiMHs in our tests) and the result we got was 2328 mAh capacity. This value is well within the minimum capacity rating for the batteries, so we can say these Maxell NiMHs perform very well and furthermore increasing the load to 0.5A and 1.0A the batteries not only manage to still provide very good level of capacity, but the difference is actually quite small between the two and even at 2.0A load we still get good capacity. 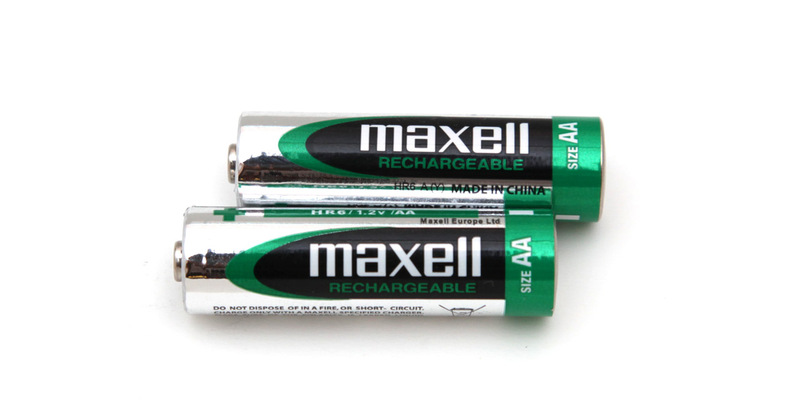 So the 1.2V AA 2300 mAh Maxell Rechargeable NiMH batteries do manage to perform very well not only in lower load applications, but in a very high ones as well by providing good capacity in various applications requiring more power.